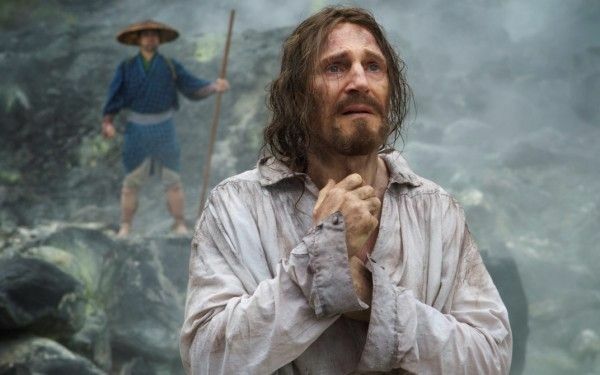 After twenty-plus years of development, Martin Scorsese‘s spiritual drama Silence will finally arrive in theaters this December. But first, 400 Jesuit priests will get an early look at the highly-anticipated film in a special screening. Paramount Pictures will screen Silence in Rome at the end of November for the crowd of priests courtesy of Rev. James J. Martin, a U.S.-based Jesuit who acted as an advisor on the film. Silence stars Andrew Garfield and Adam Driver as two young Jesuit priests who travel to 17th Century Japan to find their mentor (Liam Neeson). Further details on the film remain pretty scarce — the film wrapped last year, but we haven’t even seen a trailer yet, despite the fact that the film lands in theaters next month — but here’s what Garfield had to say about his character’s journey at a press conference last year. It’s a lifetime that the character Father Rodriguez goes through that we witness. It’s such an agonizing lifetime that he has to live through and yet he wrestles with the greatest and most important and difficult questions that we all wrestle with, which is how to live and how does one live a life of meaning, a life of faith, and does that require you to live in doubt as well? That’s just scratching the surface of why I felt drawn to this story and this character. Scorsese has a history of exploring spirituality in his films dating back to his feature debut, Who’s That Knocking at My Door (aka I Call First), through more contemporary efforts like Kundun, and of course, his hugely controversial The Last Temptation of the Christ, which was banned or censored in multiple countries and drew 600 protesters to Universal Studios upon its release. The news of the early screening suggests that, unlike The Last Temptation of the Christ, Silence will play well with religious and Catholic communities.